Another garden flower photo to brighten Saturday morning. This is a pink madevilla bloom. It is an easy to grow perennial vine with lots of blooms. Now for the exciting crafting news – Our son just started working for Michael’s and gets a 25% discount. He can use it for immediate family which is great because both his parents love to craft. I usually don’t go into too much family detail, but I thought this news was craft worthy. This entry was posted on Saturday, June 6th, 2009 at 3:00 am and is filed under Garden. Tagged: Garden. You can feed this entry. You can leave a response, or trackback from your own site. 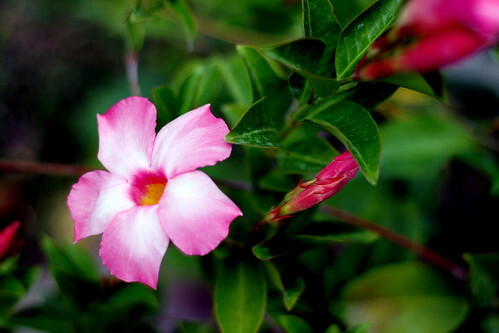 Oh, I just LOVE mandevilla! It’s one of my favorite flowers! Really!